I had an interesting appointment at a home in Punta Gorda that generated a few thoughts about pool cages. This particular client was struggling with the condition of her pool cage. The enclosure was structurally sound but she had some concerns regarding appearance. With intentions of selling the home, the client was becoming frustrated and voiced her concern as our crew was installing hurricane protection. The options were few and the stress was great. One company was going to paint the entire pool cage. In this particular situation, processing the fact that the entire house would be covered in plastic was somewhat overwhelming. Repainting a pool cage can be costly and usually does not adhere for the length of time that the investor would desire. 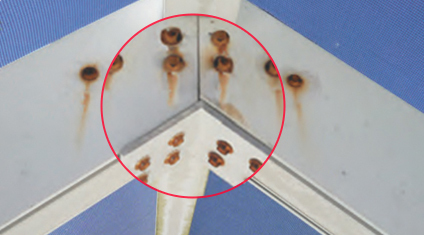 Many times, the existing pool cage is experiencing corrosion and paint that is peeling. These spots can be can be sanded but eventually return. The process of painting involves a total rescreening which is an additional investment. Unless a pool cage is several years old, the most unattractive characteristic would be the rusted screws. It has been our experience that homeowners can live with some oxidation of the paint and some fading of the aluminum, however, the rusted screws have given the perception of the cage structure being compromised. This brings another option of a pool cage makeover that can save homeowners a tremendous amount of money. This is called rescrewing. It is the method of removing a screw and replacing it with Nylo – tec screws which have plastic ends that prevent or retard the rusting. An enclosure can be brought back to life with all the rusted screw removed. This option gives the cage a crisp look and has secured the structure for years to come. Finally, the option of replacing corroded aluminum with new matching material is a bonus for the homeowner. In this setting, we are replacing all the aluminum that is chair rail height. Also, spotting of the same corrosion, we are replacing the bottom supports that are mounted directly to the pool deck. In addition, we are rescrewing the entire cage. This pool makeover will give the impression of a fresh start with the changes that have been instituted. This eliminates the concerns of covering with plastic, the fear of paint attaching in undesirable places, and the appearance of a vast undertaking. Rescreening and rescrewing, with the new material added, will be the makeover that you will find to within most budgets. This process that Harpers offers was 50% less of an investment than it would be to deal with the hassle of repainting. Before you invest in refinishing your pool cage, consider the options that Harpers has presented. Call Harpers today and set an appointment for an expert consultation on the makeover your cage may need. We will be prompt and honest in our recommendations to the homeowner. Contact our office @ 941-629-3490 today! Look for us at the Home and Garden Show in Punta Gorda this weekend. Mention this blog and receive a voucher for a for $200 off any of our services. We look forward to meeting you.